When I’m craving something sweet, I reach for my blender. I love whirring up a thick smoothie or healthy shake to appease my sweet tooth. Remember the dark chocolate peanut butter I made a few weeks ago? Well, I had this genius idea to throw a few scoops into the blender with some frozen bananas and vanilla almond milk. The result is a thick, peanut-buttery, uber chocolatey shake. Did I mention it’s healthy? You can have your shake and drink it, too. Sold! I made this shake using frozen bananas, thick Greek yogurt, creamy peanut butter, cocoa powder, and vanilla almond milk. To sweeten it up a bit, I added a touch of honey. What? Where’s the ice cream, you ask. There is none. This is an ice cream-less shake. No ice cream means less calories, which means more creamy goodness in my belly. Yeah, that’s what I like to hear. You get banana, peanut butter, and chocolate all in one glass, and it’s oh so deliciously good for you. Peel and chop your bananas. Place them on a cookie sheet in a single layer. Place the cookie sheet in the freezer and allow the bananas to freeze completely, about 2 hours. Transfer your perfectly frozen banana chunks to a freezer bag and store for future use. 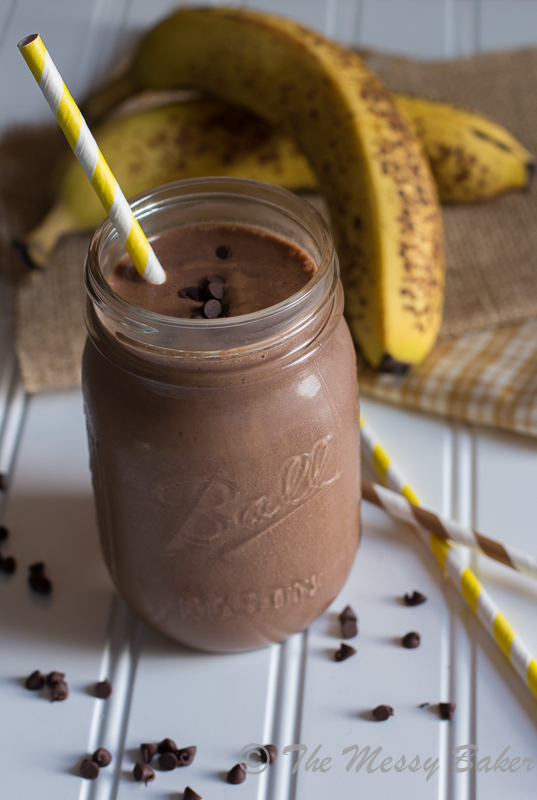 Stock your freezer and prepare for a skinny chocolate peanut butter banana shake addiction. ***Update: Since I received several emails and comments asking how many calories this shake contains, I decided to plug the ingredients into my calorie calculator. One 12-ounce shake is approximately 325 calories. 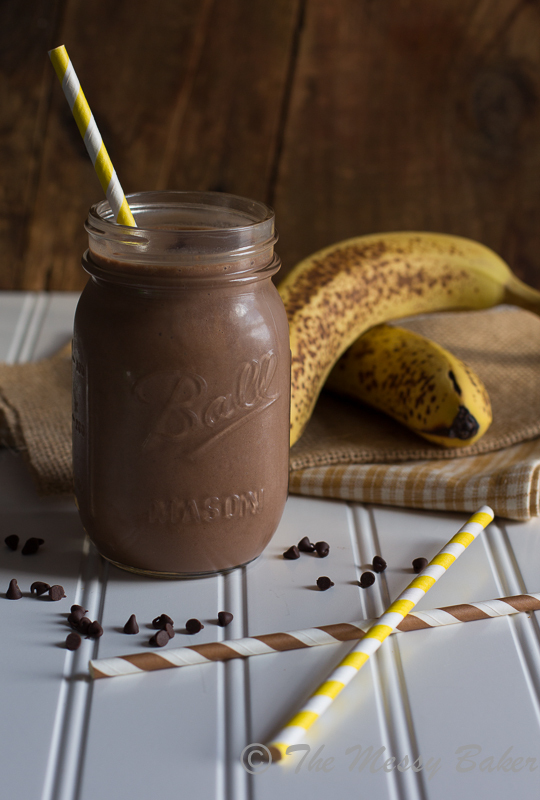 A thick, frothy shake made with frozen bananas, creamy peanut butter, and chocolate. This healthy recipe is perfect for a snack or breakfast on the go. Place all of the ingredients in a blender. Blend until smooth and creamy. If the shake is too thick, add a little more almond milk. One 12-ounce shake is approximately 325 calories. I have water polo from 5:00-7:30 mon wends and fri in the morning so this looks like the perfect thing to why me out of bed because… Tomorrows Monday, then the rest of the week it’s super late. Thank you so much for sharing thins recipe! 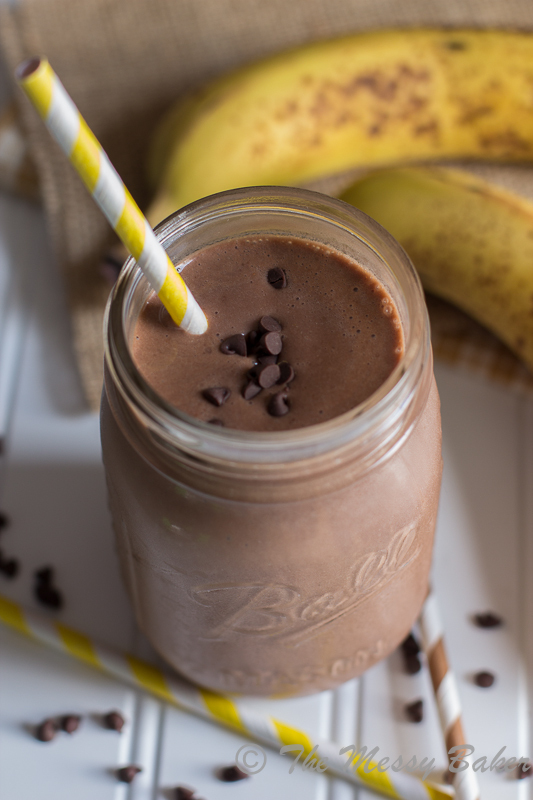 Chocolate, peanut butter, banana… that’s my kinda shake. Mine, too! I’ve been making this a few times a week. Absolute favorite combo, I will never ever say no to chocolate pb :) And LOVE that there’s no ice cream, this is great! I’m with you, Kristina. Chocolate and Pb is one of my favorites. I love that you have frozen bananas ready to go in your freezer. Thanks, Kayle! Come on over and I’ll make you one. Yes! I want to drink this all-day-loooong! Love your response, Ashley. Thanks! I’m with Ashley (above), I could sip on this all…day…long! Love how you were inspired to create this sip. LOVE! OMG… This looks so decadent but if you say it’s skinny I believe you… way to combine some of my favorite flavors! And I LOVE the straws! What a way better hing to do with ripe frozen bananas than make banana bread. Way healthier! I’m sold! This is my favorite kind of smoothie. All the best flavors. And healthy? I’m going to have to go home and freeze some bananas! Good for you and indulgent – I want this shake! Gorgeous photos, Jen! I definitely need more “skinny” in my life. There’s been a bit too much indulgence lately! This looks incredible! I am obsessed with THICK smoothies and this one looks like it’s got some serious thickness going on!! YUM! This is a great looking smoothie – very close to one of my go-to daily smoothies, YUM – delicious! Hi MH! Thanks for visiting. Mmm, almond butter sounds delicious. I’ve used chocolate almond milk in this smoothie, and it tastes just as good. This sounds lovely. The only part I would use is the yogurt since I’m vegan … and I don’t believe that I’ve ever seen vegan Greek yogurt. Do you think the shake would miss the yogurt? Thanks for sharing! I’ve made this shake with and without the Greek yogurt, and both are delicious. I haven’t seen a vegan yogurt out on the market yet. Thanks for visiting! You could maybe try to replace the yogourt with some tofu? Frozen bananas are so amazing and I am loving that dark chocolatey color! I do this sorta. I use chocolate almond milk, scoop of protein powder and a frozen banana and of course a spoonful of peanut butter for a protein filled breakfast smoothie on my way to class in the morning or even in her afternoon to stop my school snacking of junk food. Kristina, that sounds delicious. I’ve also substituted chocolate protein powder for the cocoa powder for a protein shake before my run. Thanks for visiting. Dude, why didn’t you invite me over for one of these? Or two. Or six. Oh my gosh, my whole family would go nuts for this! Gorgeous photos too! Thanks, Karly. We love this smoothie. chocolate banana shake! why did i not think of that! i’ve been making one with almond butter and dates and banana, and it is WONDERFUL for after working out; kinda like you’re treating yourself to ice cream but you’re not, you know? totally you know. :) i love this alternative. I could drink this for breakfast, midday snack or dessert. Great creation! I love everything about this shake. And I have all the ingredients. Woo hoo! the best study break I have ever had. My room-mates and I loved it! Hi Kaitlin! I’m so happy to hear that you and your friends enjoyed the recipe. Happy studying! Hi Rebecca! Thank you so much for stopping by. That fruit combination sounds delicious. I’m so glad you enjoyed the smoothie. Question for the cook — Is there anything you recommend swapping the peanut butter with? Nut allergies and all that. I’ve been making this shake too, but instead of real peanut butter I’m using the new PB powder made from real roasted peanuts. Excellent taste and MUCH LESS far and calories! LOVE LOVE LOVE! You can definitely use this shake as a substitute. I would make sure you use low fat chocolate almond or soy milk. This smoothie is very filling. For a boost of fiber, you could add a handful of oats, and for a boost of protein, a handful of almonds. Enjoy. I just made this tonight! SO GOOD, I’m going to tell all my friends. This will be my new sweet fix go to! Thanks for sharing!!! Hi Jen! I’m so happy to hear that you enjoyed the smoothie. Thanks for sharing! Hi Mari! One 12-ounce shake is approximately 325 calories. This shake is delicious. This would make a nice dessert I think. This is a very refreshing anytime of day shake. I put some of mine into the freezer and allow it to freeze. An hour before you wish to have it again, bring it out of the freezer and place it into the fridge. It is like ice cream and it is very good. That is such a great tip! Thanks for stopping by and leaving some love. I’ll have to try the freezer method next time. I have been looking for something special to make for a friend who just became a new mommy, and I think these are just the ticket! I followed the exact recipe and I think is just perfect. Thanks for sharing! I’m so happy to hear you love the recipe, Amy! It’s a great meal substitute and comes together in a jif. Congrats to being a new mama. Found this on Pinterest and decided to try this morning – this is AMAZING!! I’m considering adding a little bit of oats to it next time for an oatmeal taste, but the chocolate/PB/bananas alone are delicious! Thank you so much, Chelsea! I’m so glad you liked the shake. It does! Well, at least everyone tells me it does. I think you’ll love it! Not a fan of Greek yogurt. Would using regular fat-free yogurt be okay? Hi Laki! Regular yogurt will work fine in this recipe. Since it’s not as thick as Greek yogurt, you might have to decrease the amount of milk you use to achieve a thick shake. Enjoy! Yum!! I just made this. I was craving chocolate and scanning pinterest. Lucky me, I had all of the ingredients including the frozen bananas. I used Almond butter instead of peanut butter, but it’s AMAZING! This will be my go to chocolate fix from now on. Thank you! Hi April, So glad you love the shake! Almond butter is the best. I make my own almost weekly. Cheers! This is phenomenal! I added in some protein powder, and oh my gosh is it ever filling. Normally I have a smoothie and am hungry 20 minutes later, but this is surprisingly filling considering it’s only a few ingredients. Hi Kirsten! I’m so happy to hear you love the shake and that it keeps you full. Adding protein powder is a great tip! Hi Becky! I’m so happy you love the shake. I keep hearing a lot about this pb2. I really need to get on the wagon. Hi Debbie! I’m so happy to hear that you love the shake and that it keeps you full throughout the morning hours. Thanks for stopping by and leaving some love! It look very attractive and appetizing. I’ll follow and do it at this weekend. I have yet to try powdered peanut butter. I need to get on that. Thanks for the tip! Sounds absolutely delicious (I mean, c’mon, chocolate peanut butter!) but I can’t do yogurt (of any kind that I’ve tried) so what would be a good substitute? Thank you so much for stopping by! I would substitute 1/2 a frozen banana for the yogurt. You’ll get a thick, creamy shake. Enjoy! SO then it would be 1 1/2 frozen bananas and NO yogurt, am I reading that right? Now that makes this a very interesting option for me, I also can’t tolerate yogurt. Thanks! Barb, I think someone in the comments has given it a go with the PB2 and loved it. Just FYI….this comes out to 14 Weight Watchers smart points. I made this this morning and it was delicious! I added some Chia seeds and some cinnamon. Are there any substitutes for almond milk? Does regular milk work as well? Also, can I use hot chocolate powder as a substitute for the cocoa powder? Pingback: 23 On-The-Go Breakfasts That Are Actually Good For You - zdouf! Pingback: Look what the cat dragged in: hug-yourself-edition | miao.